At the urging of a fellow burger aficionado, Colonel Mustard, myself, and a small army went to Mission Beach Cafe to sample the burger. Upon entering the restaurant, the smokey smell of BBQ was surely a sign of delicious things to come, right? 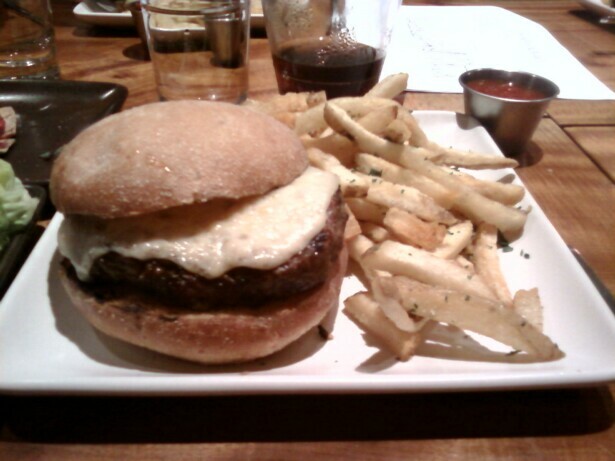 The waiter seemed pleased and proud to state that the burger at his cafe was rated #4 in San Francisco. Who the eff goes around chanting, "We're number 4--We're number 4"? That's not even good enough to make it to the podium. Runner-up status is nothing to crow about. Now take a look at these ingredients. Maybe the bar was set so high in San Francisco that this assemblage of culinary excellence wasn't enough to make the grade. This was a surefire recipe for awesomeness--the very best ingredients were sourced, and it would have merely taken a competent effort to assemble the awesome parts into a more awesome whole. And..........here we go. It would seem that the theme of the Mission Beach Cafe cheeseburger was Green--Ed Begley, Jr would have been proud. The beef, which was juicy and deliciously seasoned, came out a perfect Med Rare--it even retained some of the aged funk as a front note...........but they cooked it on a cool grill, and that gave us weak grill marks and a rubbery, gray exterior in place of a proper Maillard sear. I attributed this to the energy conservation efforts in the kitchen. There was no point in making the grill hot and using a bunch of natural gas to cook--that would be been wasteful, and would have required additional energy to cool and/or vent. 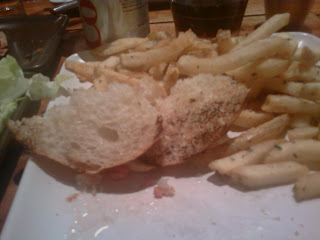 The bun was clearly made of recycled Styrofoam, and it was just too bulky for the modest burger. It was also stale and chewy. To add the final insult--rather than toasting it properly on the grill, the kitchen staff wiped it across the grill to create the appearance of grill marks with the blackened grease from the grates--NASTY and BITTER (see photo on right). The fries were obviously cooked in the same oil as some sort of fish, so they tasted nice and........ fishy--I take my Omega-3s, and I prefer not to double up on them while eating fries. They were also clearly re-fried based on the rubbery crust and sodden texture. Reclaimed oil is best used in cars not in fryers. The tomatoes were damned tasty, though. The "Key Lime Pie"....not so much. It's a fine lemon curd pie, but Key Lime it is not. The used gelatin to set the filling, and it lacked the traditional graham cracker crust. Ooof. 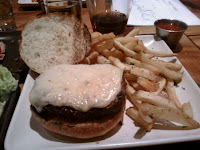 Burger Review : Meh Great ingredients are nothing in the face of a concerted effort to minimize their impact. #4 was probably generous. Sometimes, the whole is less than sum of its parts. It is fair to hold out hope for this burger, however. 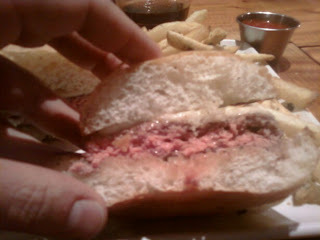 The beef and seasoning, which are the cornerstone of a great burger, were dead on.